We can't believe it's already been three weeks of camp! 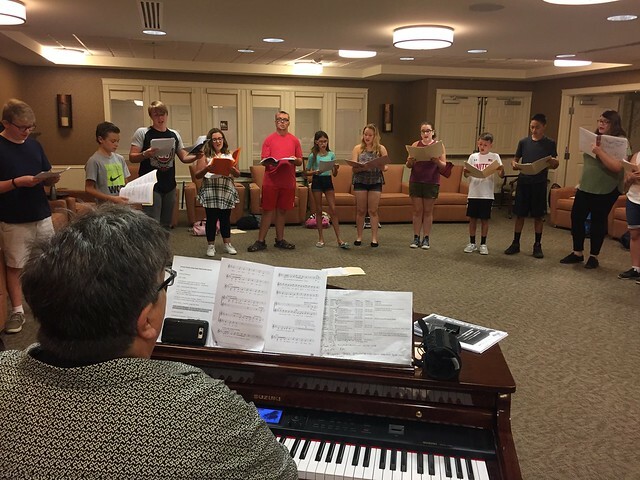 The students have even super busy rehearsing their songs and dances, and memorizing their lines for the upcoming production of Into the Woods Jr. Our first performance is in exactly two weeks! Today, on Fun Day Friday, the theme was Cinderella. The students dressed up as characters from the story. The most popular costumes included Cinderella (both glamorous and as a peasant), mice, and the cat Lucifer. Today, on Day 10 of camp.. It was FUN DAY FRIDAY! Today's fairy-tale theme was Jack and the Beanstalk and many of the kids dressed up as characters (or objects) from the classic story. Popular costumes of the day included Jack's mother, the cow (Milky White), the beanstalk, and the golden egg. After a day full of music rehearsal, practicing lines, and blocking, we ended the day with an hour full of fun games that the students seemed to thoroughly enjoy. We can't believe it's already been two weeks! 3 weeks from today we will put on the first official performance of Into the Woods Jr.! Our morning of workshops included an art project where each student assembled a tree to contribute to the set for the show, and one workshop full of ensemble building theatre games where the students had SO MUCH FUN. We had a morning full or workshops. The first was an ensemble building workshop, where we played some fun games to bond the cast and build trust among one another. The second workshop was about painting a picture with music. Here the kids listened to and discussed how parts of music can hold emotion and energy, and represent many different feelings. Warmed ourselves up with a game, then split up into two groups to participate in two different workshops. One workshop was about fairy-tales, and the other provided helpful public speaking tips with some information on storytelling and acting within a certain environment. After lunch, we reviewed choreography, then we went Into The Woods for rehearsal. We closed the day with some more fun theatre games. Today was our very first Fun Day Friday: Red Riding Hood edition. The students dressed up as different characters from the classic fairy-tale. We had an awesome first week! Accomplished our usual morning routine and played some exciting theatre games to warm up for the day ahead. The students were then split into two groups where they participated in some workshops. Activities throughout the day within the workshops included painting, drawing, singing, dancing, and even reciting a few tongue twisters. - Tomorrow is DRESS UP DAY! The students can dress as their favorite character from the fairy-tale Little Red Riding Hood. Characters include Red Riding Hood, Granny, the Big Bad Wolf, the Huntsman, etc. - Don't forget to bring a water bottle, binder with script, and a pencil every day. Started off as usual, by playing some fun theatre games to get each student warmed up with their bodies and voices. We continued with two in depth workshops where we learned about some technical theatre terms in one lesson, and learned about the practice of storytelling in the other. After lunch, we learned and reviewed some songs for our upcoming production of Into The Woods Jr. Following this, we learned and reviewed some dances and ensemble numbers for the show. Started off by playing some fun and new games to get the students warmed up in acting theatrical. We then stretched out to relax and prepare for the upcoming audition today. We finished the morning by reviewing some songs and the dance for the students' auditions. After much anticipation, the time finally arrived for auditions! The students individually performed their audition songs, and together danced and read scenes from the show. To close the day, we did some community building exercises and games. Introduced ourselves and played several fun theatre-related games to start off. The games included "captains coming", "freeze-pose statue", and "name game". We had an audition workshop where we covered how to properly prepare for the best audition possible. We also learned the audition songs and dance for tomorrow's audition for Into The Woods Jr., and the director talked about her vision for the show. We closed by reading through the script and listening to the music for the entire show. The cast list will (most likely) be posted on Wednesday, July 12th.